In 1921 my family and I moved to Berry Cottage, exchanging homes with Gordon Spackman’s family. My father was a painter and decorator, and a water engineer, running the water pumping in Station Rd and the Fen drainage in Earith Rd and we needed larger premises. The lean-to on the side of the house was a dairy used by Mr. William Norman who moved to the Acacias in Long Lane. The building on the right was built about 1924 as a shop. The front railings were requisitioned in 1940 for the war effort. Many villages lost their railings but many were never used as they were made of the wrong metal. The car, previously owned by Sir Frederick Hyam, was a 12HP Humber. One luxury it had was a screen for the rear seat. One of the downsides was that it had no driver’s door, the reason being that the petrol can and spare wheel were attached to the running board. The vehicle had no self-starter (it had to be hand cranked) and the screen wiper was hand operated. It was the first car in the village to tow a trailer. 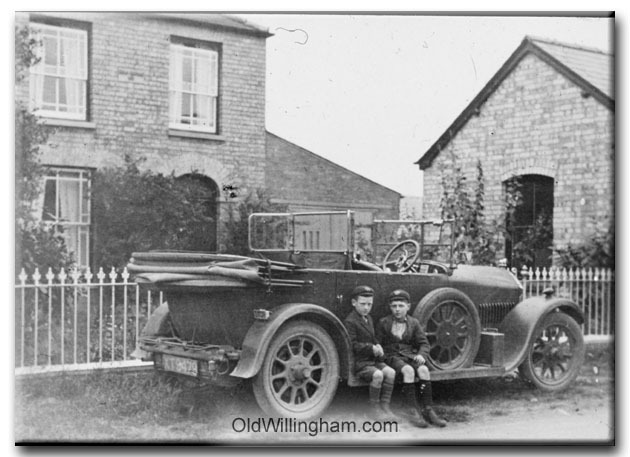 In 1932 the car was sold to Alan Bloom of Oakington, later of Bressignham Steam Museum. Note that, at that time, there were no curbs or footpaths.